China's moon rover suffered a mechanical anomaly before going to sleep Saturday at the onset of the two-week lunar night, according to state media reports. The state-run Xinhua news agency reported the problem occurred due to the "complicated lunar surface environment," citing the State Administration of Science, Technology and Industry for National Defence, or SASTIND, the Chinese agency responsible for the mission. Official government-run media reports released no other details on the nature of the glitch, but Xinhua published a story Sunday touting the difficulties of space exploration and sharing goodwill messages it said were collected from Chinese space enthusiasts. The independent South China Morning Post newspaper in Hong Kong said Xinhua appeared to be preparing the Chinese people for bad news. "This is too heavy a burden," said Zhang Yian, a Beijing-based writer, according to Xinhua. "If the rabbit can not stand again, maybe we should let it have a rest." 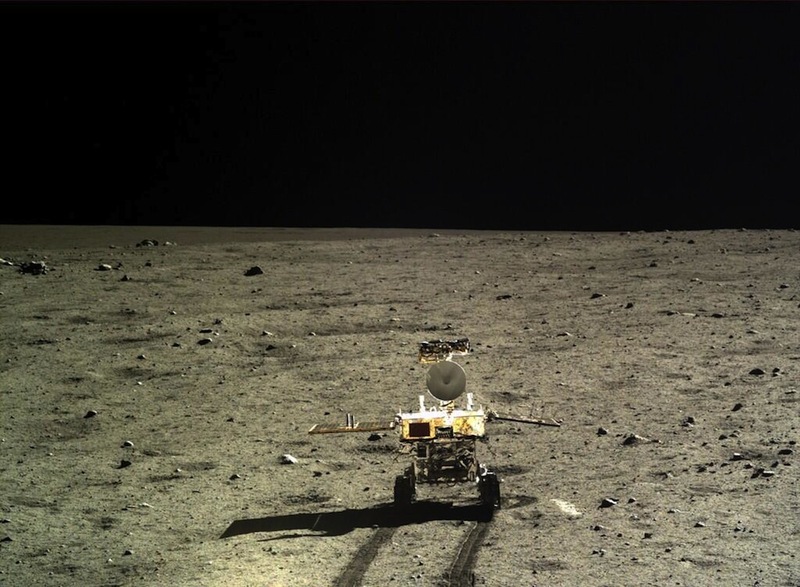 China named the rover Yutu, which means "jade rabbit" in English. The six-wheeled Yutu rover is designed to hibernate during the lunar night, when the sun dips below the horizon for two weeks and temperatures plunge to minus 180 degrees Celsius, or minus 292 degrees Fahrenheit. The rover is fitted with solar panels to generate power for the vehicle's science instrumentation, radio transmitters and other equipment. Before the sun goes down at Yutu's landing site, the rover is programmed to fold down its camera and antenna mast and retract its solar panels. Yutu carries plutonium heaters to keep the rover's delicate electronics warm at night. The rover ran into trouble while executing procedures to configure itself for the lunar night. Unofficial accounts posted to Chinese websites claimed the rover was unable to stow one of its solar panels over the retracted camera mast on top of the robot's instrument deck. There was no confirmation Tuesday what the situation meant for the rover's future. Chinese engineers may not know more about the rover's condition until it is scheduled to wake up around Feb. 8 or 9. The rover was designed to operate at least three months after touching down Dec. 14 on the moon's Mare Imbrium region, a dark feature carved out by a massive meteorite 3.9 billion years ago. The lander touched down on a thick deposit of volcanic material that filled the Mare Imbrium impact basin about 3 billion years ago. Chinese officials say the rover has logged about 100 meters, or more than 300 feet, since landing. Yutu endured its first two-week nighttime hibernation in late December and early January. 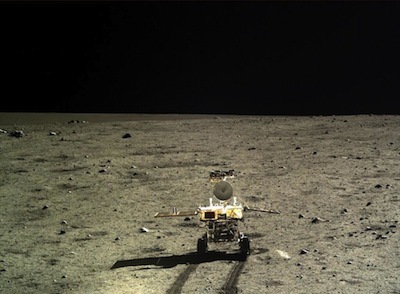 Yutu used a mechanical scoop to sample the lunar soil earlier this month, according to state media, and it studied the moon's underground structure with a ground-penetrating radar. The robot used X-ray and near-infrared spectrometers to measure the composition of lunar rocks. Engineers also established a radio communications link between the four-foot-tall rover and its stationary landing platform. Chinese media have reported no problems with the four-legged lander, which has its own suite of instruments including an ultraviolet telescope to observe Earth's plasmasphere and conduct the first long-term astronomical observations from the lunar surface. Yutu is part of China's third lunar mission. 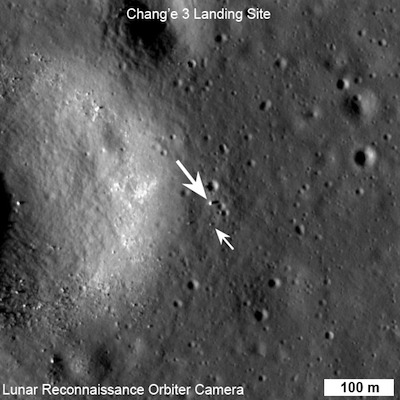 Named Chang'e 3, the project achieved the first soft landing on the moon since 1976 and followed two Chinese lunar orbiters launched in 2007 and 2010.